Marudachalakkadavul Pillaittamizh speak of the glory of this shrine. This simple hill temple on the Marudamalai hill 10 km away from Coimbatore is one of the Murugan hill temples in this region associated with the mystic Tamil Siddhars. Sivanmalai is associated with Sivavakkiyar, Chennimalai with Pinnakku Siddhar, Palani with Bhoga Siddhar and Marudamalai with Pambatti Siddhar. herbal medicine. His songs are addressed to snakes. Antiquity: This temple is over 800 years old, as it has been referred to in inscriptions in the Tirumuruganpoondy temple near Avinashi. 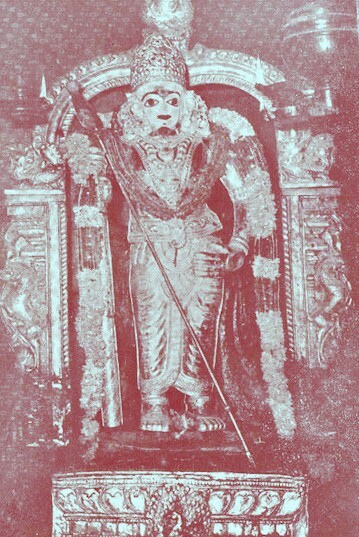 Tirumuruganpoondy is a Tevara Paadal Petra Stalam and is at least 1200 years old. Marudamalai is also referred to in the stalapuranam of the Perur temple near Coimbatore. Marudamalai is considered to be one of the 5 hills associated with Perur as mentioned in its stalapuranam. Another of these hills is Velliyangiri, about 40 km west of Coimbatore, in the western ghats. Velliangiri is considered to be a sacred hill, and pilgrims trek to the top of the hill from Maha Shivaratri to the Agninakshatram period in May. The other hills associated with Perur are Neeli malai or Uma Devi malai, Ayyaasaami malai or Bhrama malai and Perumaal mudi or Vishnu malai. The Temple: This small temple is built on the Marudamalai hill at a height of 600 feet. The Dhandayutapani form of Murugan is enshrined in the sanctum and worshipped. Also on the hill are the cave and spring associated with Pambatti Siddhar. Awareness of Marudamalai has been enhanced through feature films produced by Chinnappa Devar in the 1970s.